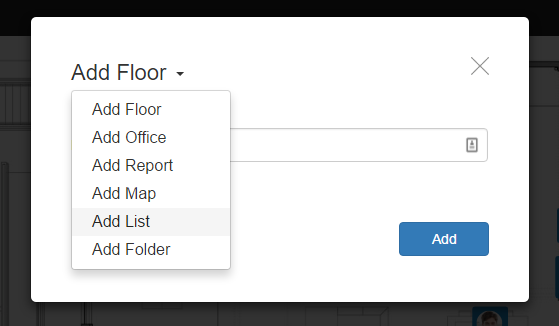 In order to add a Floor in StaffMap, an administrator will need an image, or an image URL, of the company floorplan, blueprint, layout diagram, etc. Unlike Employee images, Floor images are not resized or converted to JPEG format. We recommend using an image with high resolution, low file size, and dimensions that are under 4000x4000px. Allowed extensions are: JPG, PNG, GIF, and SVG. The dimensions of the image will be used as the default dimensions of the floorplan. That means when a user accesses a floor, it will be displayed as large as the original image file is, unless the dimensions are customized. Users may zoom in and out of the floorplan, altering its display dimensions. Select the Add button from the top toolbar. Select Add Floor, enter a name, and select Add. 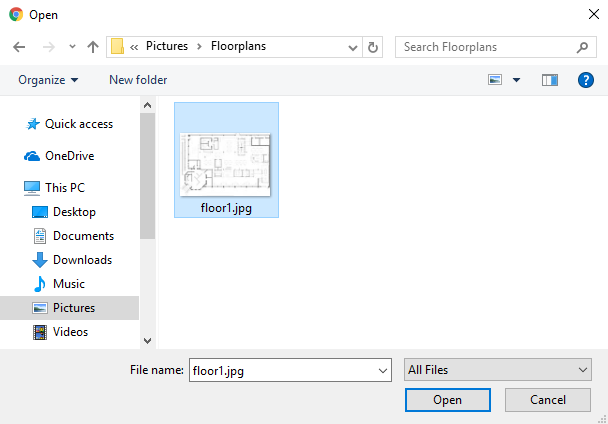 In the resulting File Explorer window, select which file image you would like to upload and select Open.